Hi -- I hope there's still life here. I've installed Classic Start Menu on a new Windows 10 x 64 system. I click on Start and then mouse over Programs. That displays folders and links from two different places. These appear to be the same places I get if I right-click on Programs and then choose Open or Open All Users. I only want to see the contents of Open (not Open All Users). The folder that opens when I click Open is the one I have customized for my own purposes. This is new behavior. I must have configured it, previously, to perform as desired, but somehow that didn't get saved when I saved my settings. Or maybe it's a quirk in Win10 version 1809, which I've just newly installed for the first time. TIA for any ideas. I looked through the menu settings options and didn't see anything that looked like the answer. If the user (fred) says no; it creates a shortcut in freds start menu folder. but this means new programs you install wont be able to automatically add shortcuts either. Thanks for the quick reply! I wasn't sure if anyone still used the classic version. Could barely live without it, myself. Once I've run that, here's what has always happened when I click the Start button, using Classic Start Menu. I mouse up to the Programs item. What pops up is only the contents of the folder at X:\Start Menu\Programs. That part hasn't changed. What has changed is that I'm also seeing the contents of C:\ProgramData\Microsoft\Windows\Start Menu\Programs. So I think the question is whether there's a way to prevent display of the latter. This may be the question you were addressing, but if so I don't know exactly how to proceed. Trying to insert an image here. It appears in the edit window, but not in the submitted final. Anyway, it's at https://i.imgur.com/ebBAwTt.png. To get the situation shown in that image, I clicked on Start and moused over Programs. (Mouse cursor not shown.) The items in the right-hand list shown in orange are in X:\Start Menu\Programs. (So are the _Incoming and Miscellany folders, but I've already visited those, so they aren't displayed in the "new item" orange anymore.) Otherwise, the items not in orange are in C:\ProgramData\Microsoft\Windows\Start Menu\Programs. Those are the ones I don't want to see. Now click on the link field and paste "X:\Start Menu\Programs" and then hit OK and OK again. I've always used the registry edits. I didn't know it was possible to do that redirection in Classic Start Menu. Hopefully I am at least in the desired place. Clicking on the Label field unfortunately didn't open up the Link field; it remained grayed. Possibly there is a problem with my Classic Start Menu installation. 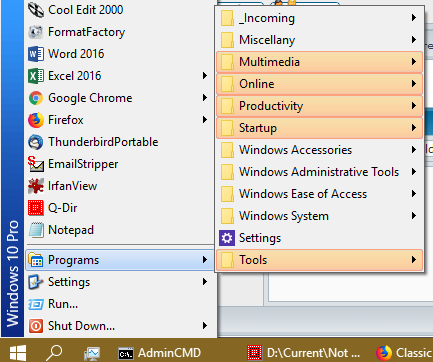 I am noticing that, although I have checked Main Menu tab > Show recent programs on top, the list on top of the Start Menu is not updating with recently used programs.